With all the doom and gloom coming out of Washington these days, and with thanks to the good people at geekologie.com for bringing this little gem to the surface, it is nice to see that creativity is still alive and well in the world of commerce. 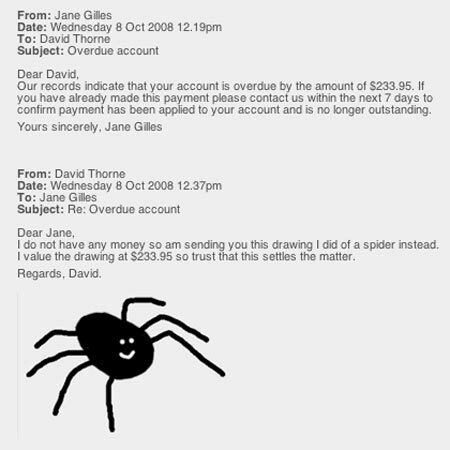 True, the creativity involved is somewhat out of place, but you have to admire David Thorne and his gumption in trying to pay a past due bill with a drawing of a spider; and you can’t help but applaud billing representative Jane Gilles for her measured and professional response throughout. To see the whole, hilarious exchange, visit geekologie.com. It’s worth it and that is the bottom line!